In Genesis, God commanded us to “subdue the earth, and take dominion over all the world.” In 2 Corinthians 10:5, Paul commands us to take every thought captive, and make it obedient to Christ. That has never been more important than it is today in the digital age. If we ignore the world our students are living in, and one day working in, then we will fail in preparing them to take every thought captive. It is a very daunting task, but one we must face. Let’s partner together and face these new challenges in a way that honors our Lord and Savior, Jesus Christ. Provide an internet agreement policy. Provide the device needed for school. Provide tech support for the student and parent. Provide filtering mechanisms for devices. Provide seminars and resources for parents. During classroom instruction time, teachers can monitor student laptops by controlling what websites and applications students are able to use in order to improve student attention and work productivity. Teaching time is precious, and we have a responsibility to make sure that every aspect of the classroom environment is conducive to learning. Common Sense Schools are committed to deep implementation of the Common Sense Digital Citizenship Curriculum. 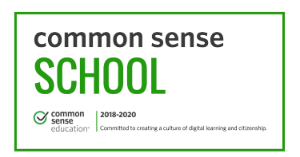 Earning the Common Sense School badge is a symbol of a school's dedication to helping students think critically and use technology responsibly to learn, create, and participate. Learn more about criteria for recognition as a Common School.